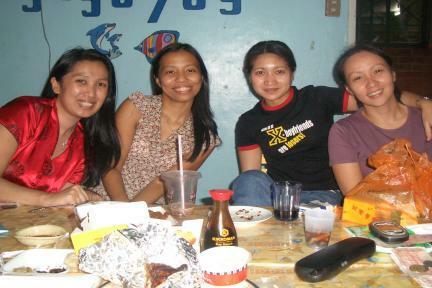 Karen, Macre, Len, and I decided to have a bonding session last Friday. The guys were nowhere that day and so we decided to have some quality girl talk. We pigged out on junk food, muffins, siomai, and coffee. We got drunk drinking coke. It was a blast. Raffy (len's sis-in-law) also joined us along with our "honorary girlfriend" Francis. It was fun bonding with the girls. I call it a rare moment in my life when I'm actually with girls than with guys. For a self confessed one of the boys being with my girlfriends is a welcome experience. We talked about all the latest gossips and happenings in our lives (despite being together almost every other day). And though some of our stories were already redundant, we painstakingly listened to each one of them..Karen was all smiles in her text messages (hmmm...bakit kaya?). My cellphone actually became a message relay center. Macre was in a warpath and so was Len. Raffy was busy planning her party tonight too. We all had our own stories to share. And I was happy that my girlfriends did not think I was crazy because all I could talk about was you know who (or I guess they have long accepted by cheezy sentimental self). We pondered about how to adjust to life without SB. Nakakadepress. By 730pm we decided to have pizza delivered. Imagine this 5 girls ordering a 20 inch yellow cab pizza. Crazy! Daddy was amazed by our appetite (and will power to eat). George surrendered to the girl power the moment we started singing to foolish heart, jealous, and moonlight over paris. This is the kind of gimik that I like. I don't like going out on bars and all those noisy places. Good food and good talk with great friends is enough to make a day happy. Another reason to smile. Today I woke up with a cat sleeping on my lap and my leg heavily under cramps. I actually slept in my car. Someone was stupid enough to lock our second double lock at the main door hence I could not get last night. And being so late, no one was actually answering our phones. Hay naku! When I realized I was locked out, I was so tired to even bothering getting pissed off. Fortunately for me, there wasn't any mosquitoes hovering around so I was still able to get some good sleep despite my uncomfy position. It was a real blooper. Buti na lang I came from a happy gimik at badminton. Practiced with Marie for addidas as well as with Peter for our last Pamilya tournament. We had a grand time laughing at each other's bloopers as well as making our kupal feeling coach uncomfy in court (bad!!!). The pamilya partnership continued to go under debate. Of course before anyone, I prefer to have my original partner with me (sorry annie you can't borrow.hehehe). So by the time I got home, it wasn't nightmarish anymore to realize that I was actually gonna camp out in the garage. My sister woke up at 5:30am to let me in and finally sleep in my beloved bed. A fruitful weekend. Sana ganito na lang forever.